Wow, this was quick, you just submitted yesterday. Wait a sec! It's not Lariel's birthday today, is it? *Panics* I though it was on the 26th? You did a very good job, considering the source pic. I have some experience with low quality pics so I know how hard it can be! Ho! It look totally awesome. The vector just take my breath away! In so im glad to announce that you earn my first ever Favourite on Minitokyo! Congratulations! lol XD you call that freaking awful low quality? sure it isn't the best quality but I've vectored from worse quality than that! of course it didn't come that great. I think erika means the highlights on suzaku's hair. oh and happy birthday to lariel! Beautiful vector, i've seen the scan before and it do look quite messed up ^_^' But still, you made it to vectored it ;) Good JOB! well i also saw a clear and nice quality of this scan here in MT but i guess you didn't saw it..
anyways nice job on the vector ;) love the hair and its outlines XD nice work also in its coloring :D +fav! You did a pretty good job on this one, as always, your vector looks really perfect and high quality! Looking foward to your next work..
Verbose! you're really into it! Awesome! You made such a great job! that's so beautiful! 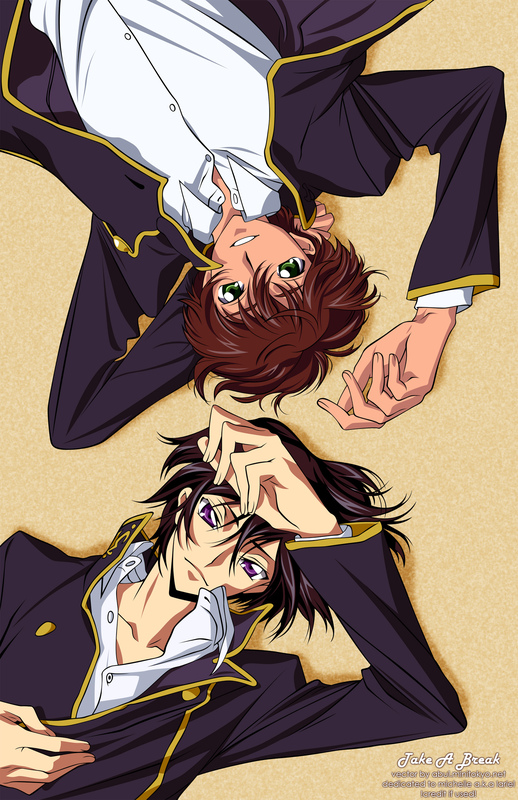 I like Lelouch and Suzakku expressions, so nice! wow thanks! love em both! double hotness! Bishies are so rare in real life damn it! :( Neat!